Kyla Dickson, who was hired as the new head coach of the women’s field hockey team this summer, smiles during practice with her team. Dickson played field hockey at Siena College and served as head coach of the field hockey team at Becker College for two years. Photo courtesy of K.Dickson. 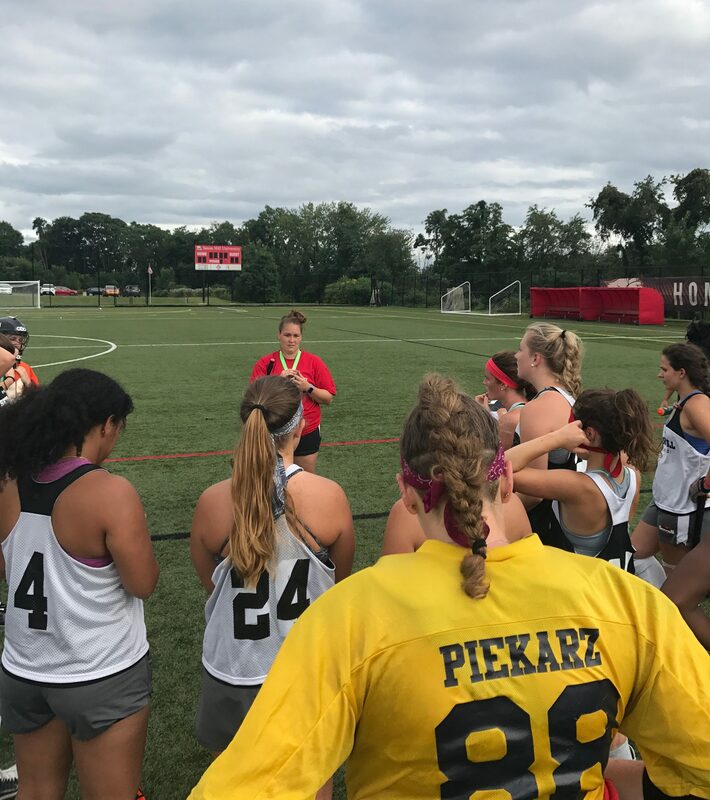 As the fall athletic season kicks off at Seton Hill University, one of the biggest changes is the new head coach of the women’s field hockey team: Kyla Dickson. Dickson grew up in Massachusetts and began playing field hockey when she was five years old. She attended Siena College in Albany, N.Y. where she played defense on the Division I field hockey team and graduated with a degree in psychology. After four years at Siena, Dickson moved to Ithaca, N.Y. to obtain her masters in sports psychology at Ithaca College. During her year at Ithaca, Dickson also served as an assistant coach on the field hockey team, which is when she realized she wanted to coach for a living. 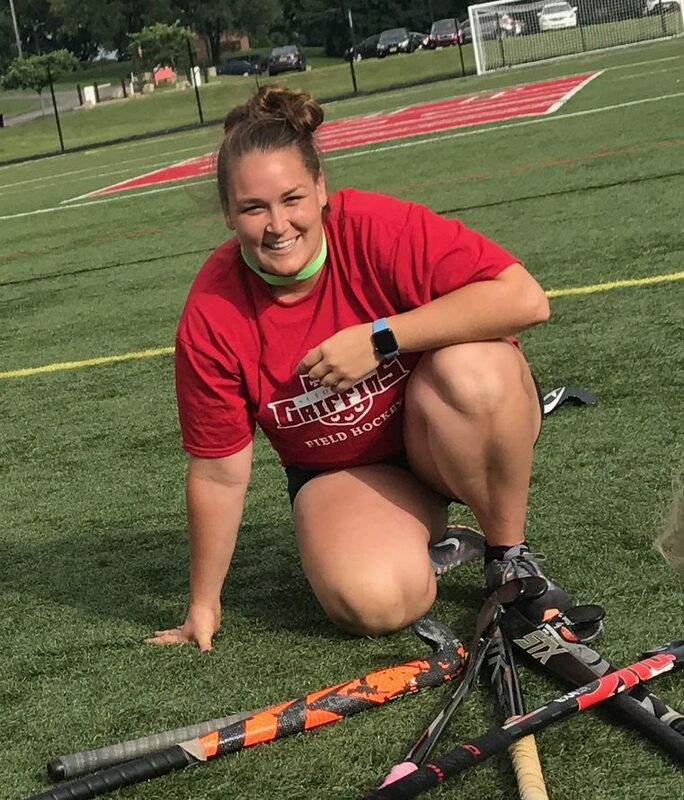 After five years away from home, Dickson returned to Massachusetts and volunteered as a middle school field hockey coach. She then became the head field hockey coach at Becker College in Worcester, Mass., where she remained for two years. During her first year at Becker, Dickson led her team to a conference championship and the NCAA Tournament. She also serves as a USA Field Hockey Level 2 coach and coaches in the Futures program, which consists of training middle and high school athletes who want to play field hockey at an elite level. Although she enjoyed her time at Becker, Dickson was searching for a school where she could be a full-time head coach. She said it was easy to see the connection between her alma mater of Siena College and SHU because the two schools share many of the same values. This season, the field hockey team is led on the field by four captains: seniors Kayla Chapman, Mackenzie Nalepa, Molly Childress and Jane Eberhardt. Dickson said she does not normally choose four captains, but they will help fill the gap of not having an assistant coach. Seton Hill field hockey head coach Kyla Dickson instructs her team during practice last week. As of Sept. 7, the team is 1-2 under their new coach. Photo courtesy of K.Dickson. Last season, the field hockey team went 3-15, and as of Sept. 5, the team is 1-1. They recently returned from South Carolina, where they lost to Newberry College on Friday and defeated Converse College on Sunday. Dickson said it would be ideal to win more games this season, but she hopes her coaching can help change the “team culture” and build confidence in her underclassmen. Dickson said that because of the time she spent studying sports psychology, she values teamwork, leadership and the mental aspect of the game. She recently gave a leadership presentation to her team, where she described some of her philosophies as a coach. With a few games under her belt, Dickson said she has already seen change occurring within the team and is excited to see how her players influence each other throughout the season.